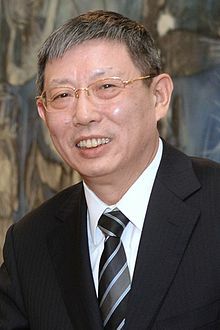 Yang Xiong (Chinese: 杨雄; born November 1953) is a Chinese politician and business executive who served as Mayor of Shanghai, and prior to that, Chairman of Shanghai Airlines. Yang is a graduate of the Chinese Academy of Social Sciences with a master's degree in economics. Yang Xiong traces his ancestry to the Hangzhou area of Zhejiang province, but was born in Nanhui County, Jiangsu province (now part of Pudong, Shanghai). He completed a graduate degree from the Chinese Academy of Social Sciences in July 1985. He worked in a variety of positions including chairman of Shanghai Airlines. In February 2001 he was transferred to the municipal government of Shanghai. In February 2003 he became a vice mayor of Shanghai and in January 2008 was promoted to executive vice mayor. On 26 December 2012 Yang's predecessor Han Zheng, who had been elevated to the position of Communist Party Secretary of Shanghai, resigned as mayor and Yang was appointed the acting mayor of Shanghai in place of Han. On 1 February 2013, he was elected Mayor of Shanghai by the Municipal People's Congress. On 17 January 2017, Yang resigned as mayor. He was replaced by Ying Yong. Unusual for an official of his rank, Yang has never been a full nor alternate member of the Central Committee of the Communist Party of China. ^ a b 杨雄同志简历 [Biography of Yang Xiong] (in Chinese). People.com.cn. December 2012. Retrieved 30 December 2012. ^ "Yang Xiong". China Vitae. Retrieved 2015-01-12. ^ 韩正辞去上海市市长职务 杨雄任上海市代市长. Eastday (in Chinese). 26 December 2012. Retrieved 30 December 2012. ^ 殷一璀当选上海市人大常委会主任　杨雄当选市长 (in Chinese). Central Government of China. 1 February 2013. Retrieved 2 February 2012. ^ "31省份中央委员及候补委员分布一览". Caixin. March 22, 2013. This page was last edited on 6 April 2019, at 06:43 (UTC).